The question of when or if to resist authority is central to organized human life. As Fromm’s comment suggests, the mythic traditions of the Hebrews and Greeks, and their emphasis on acts of defiance against God and gods, cast a long shadow. But as the gods recede, or become more symbolic, debates about the validity, limits, sources, and potential abuses of governmental authority become prominent. One of our texts, Sophocles’ play Antigone, so effectively frames these issues that the title character’s fierce and principled resistance to her King’s seemingly godlike authority resonates as powerfully today as it did on the Athenian stage. The issues at stake in this play, and in the other works we will discuss, are at stake anywhere that humans connect the grounds for their adherence or resistance to authority on principles that transcend mere appeals to power, expediency, and self-interest. These issues are not unique to particular cultures, periods of history, or forms of government. 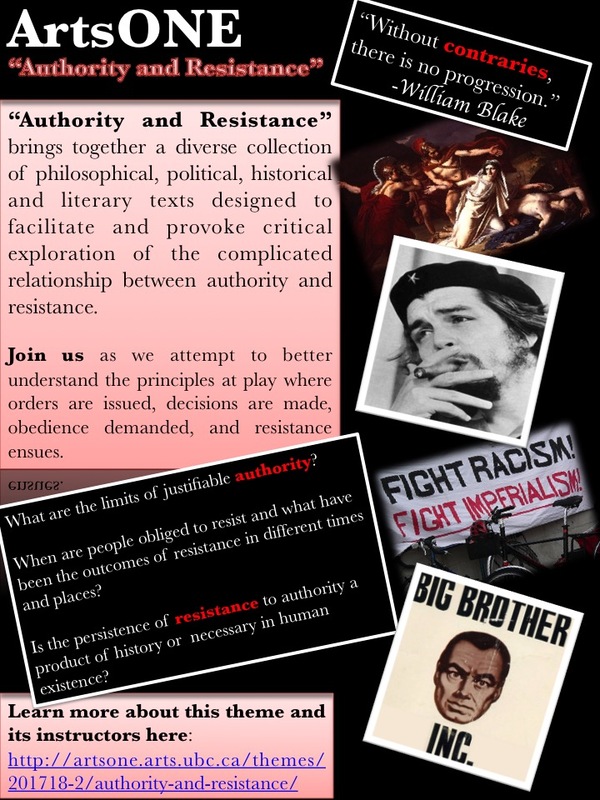 In this course, we bring together a diverse collection of philosophical, political, historical and literary texts designed to facilitate and provoke critical exploration of the complicated relationship between authority and resistance. Such exploration is not always easy or welcome because, in much of the world, obedience to authority is thought to bring safety, security, and order, while resistance brings chaos, anxiety, even death. But we will consider where and when resistance might be justified, whether it is a futile and/or destructive impulse; and whether its persistence is evidence of an essential connection to human growth. We invite you to join us in our attempt to better understand the principles at play where orders are issued, decisions are made, obedience demanded, and resistance ensues. Here is the Text list for the 2017W academic year. Texts lists are subject to minor modification.